What is an OLED (Organic Light Emitting Diode)? 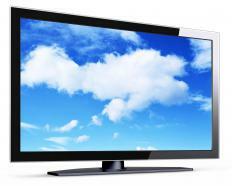 OLEDs can be used in flat screen televisions. An OLED (organic light emitting diode) consists of an emissive organic material, that when supplied with an electrical current, can produce a superior full-color flat panel display. Several factors make OLED superior to LCD or CRT technology. The most obvious difference is that OLED is so ultra-thin it can even be placed on plastic film! This makes it much lighter than older technology and a great advantage for hand-held devices, laptops and notebooks. It even opens the door to flexible displays. OLED is also brighter and has better contrast than LCD, but does not require back-lighting. It consumes about 20% less power than LCD, and has a response time every bit as fast as CRT displays. Add to this favorable list that OLED displays can be clearly viewed at nearly any angle -- a full 170 degrees. As if this wasn't enough, they boast exceptional clarity and refresh at a rate 3x faster than is necessary for standard video applications! An OLED display consists of very thin sandwiched layers of materials. When an electric current is supplied, the negatively charged electrons in the cathode layer move through the organic substances towards the positively charged anode layer. The reverse happens from the anode's side, as positively charged electrons are drawn towards the cathode leaving holes in the conductive material. These positively charged holes jump to the organic material to recombine with electrons, which causes electroluminescent light. The chemical composition of the organic material dictates which colors of light are produced. Eastman Kodak invented OLED technology in the early 1980s and has been improving upon it ever since, along with other companies. Sanyo Electric and Eastman Kodak united for a joint venture, SK display, to make the first OLEDs available commercially in a digital still camera introduced in 2003, the EasyShare LS633. Another breakthrough occurred in October 2004, when AUO Technology Center announced the very first double-sided active matrix OLED. This display can show two separate images on a single panel, moving or still, using both the front and back of the panel. This is ideal for applications such as flip-phones that have external and internal screens. Virtually every product that uses LCD or CRT technology is a candidate for OLED, including game devices, cellular phones, video cameras, DVD players, GPS, audio displays, PDAs, notebooks, monitors, and televisions. With the low power consumption, virtual weightlessness, clarity, brightness and wide viewing angle, OLED is the next generation display technology. What Are the Different Uses of Organic Light Emitting Diodes? What Is a Stud Diode? What is a Junction Diode? As a TV repair engineer (once!) I like to keep abreast of new technology and one of my findings is that the linear purity of green is not correct on LED backed LCD screens. If you look at the Samsung sets, when a full screen of green is transmitted, when viewed at the side of other screens, i.e., plasma and cold cathode tube backed ones, the overall effect looks tinged with blue! My guess is that the color temperature of the white backing diodes still are not right. Down to galium arsenide? From John B. @ Aplenty- Most of the light emitting diode (LED) televisions on the market are LED back lit televisions. These televisions still use LCD screens, but instead of a bulb back lighting the screen, it is an array of LED lights and special diffusion panels illuminating the television. The benefits of LED back lit televisions are numerous. They are lighter, slimmer, easier to dispose of, produce a greater dynamic contrast, and can show more colors. The resolution remains unaffected because that is a feature of the screen, not the lighting. LED screens cost a little more, but they use about thirty percent less energy than LCDs lit by compact fluorescent bulbs. The energy savings may make up for the extra cost. is only about one tenth that of a traditional LCD screen, so you would need to replace your TV more often. If I were in the market for a new television, I would buy an LED LCD TV and wait four years or so for the OLED technology to mature. My cell phone has an OLED screen, and it is the best screen I have ever had. It is almost as bright in direct sunlight as it is in the dark. The colors are also very vivid and detailed. The screen is big for a phone. It has offered up hours of entertainment for my daughter in airports, restaurants, and holiday lines at the post office. I would love to have an OLED TV. Does anyone know if the LED TVs on the market are OLED screen TVs, or is this something else?